This looks delicious. My mother used to make soda bread, but I’ve never had this kind of apple cake. Seeing one cooking over an open fire in the old iron pot must have been amazing. Thanks for another great Irish recipe. It’s a very rustic, hearty cake, Mary. Nothing delicate about this one, but simply delicious. Love it! I’m adding this one to my pile of ‘Mairead’s recipes’ to try! Thanks for sharing! Aimee – Hope you enjoy it as much as we do. Just fantastic! My mother made those when I was young. I haven’t seen one anywhere in donkey’s years. I’ll have to prod the wife to make one. Thanks. Michael – It’s so easy I’d say you could even make one yourself and surprise your wife. Glad to be able to bring back memories of your mother’s cooking. Thanks, Máirín. Wouldn’t it be lovely if all our husbands surprised us with a home baked cake every now and then. I might do it tomorrow, it looks delicious. Happy baking this weekend, Mariana. I am a big fan and follow you on FB. Congratulations on a entertaining and useful website. George – Thanks so much for following my blog and for all your support on Facebook. Thanks also for the link to your Pinterest boards. I clicked the tab to follow you. You have a great collection of interesting boards. Pinterest is really amazing and totally addictive. I could spend hours scrolling through beautiful pictures, so I have to limit how much time I spend on it, or I’d never get anything done around the house. Anyway, thanks again for your kind words and have a lovely weekend. That looks amazing! 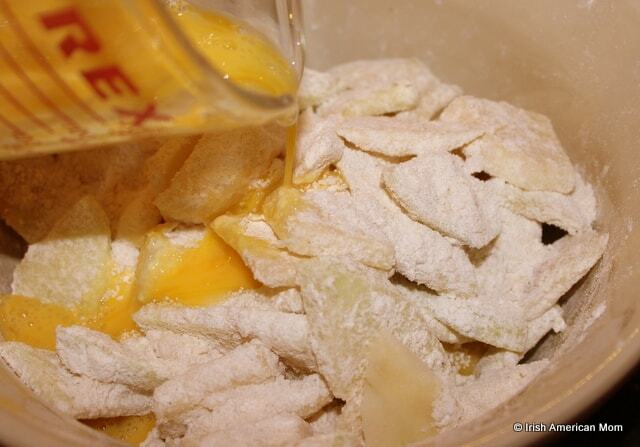 I think I’ll pick up some apples this afternoon and maybe even make this tonight! Hope you enjoy it. I think I’ll have to make another one today, too. The one I made for this blog post only lasted less than an hour in my house. Everyone loves it. Thank you for this recipe! Will be baking as soon as I can visit Trader Joe’s or Jungle Jim’s to buy Kerrygold butter. Will be waiting for your future post bringing a bit of Ireland here in Kentucky. 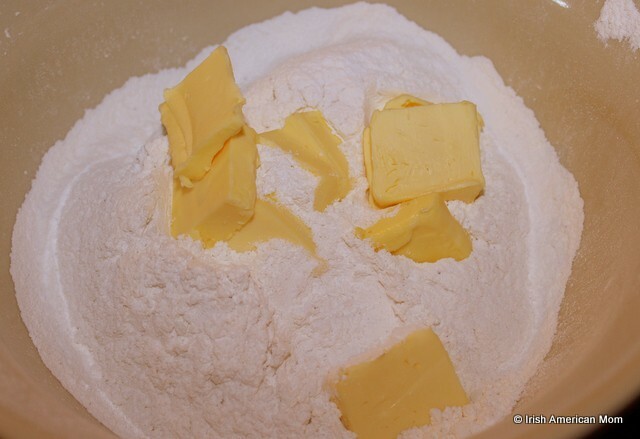 Sharon – I too use Kerrygold butter for my baking. You just can’t beat the flavor it adds to cakes and breads. American butter just doesn’t compare in my book. American farmers are probably scowling at me for saying it, but once you have tried Irish butter you’re taste buds just won’t settle for anything else. Take care, and thanks for checking out my recipe. Can’t wait to try this Apple Cake sounds great. So glad to have found this site…. Mary – I’m delighted you found our little Irish American corner of the world wide web too. Hope you enjoy this Apple Cake. It’s one of my easy go-to recipes, for a simple but tasty treat. Thanks Maureen. I intended to take a photo of a cake slice on a plate. I was in a rush out the door when I took it out of the oven. I snapped a few shots and then intended to take a few more of a single slice when I got back. The poor cake didn’t last long enough for me to take my photos. It was practically gone when I got home – the sign of a good cake. Thanks, Maureen. I think I’ll have to make another one tomorrow. Thanks so much for sharing! Had a lot of fun making & eating this! Even my two year old & husband helped out. Jennifer – So glad your family enjoyed making this cake together, and especially that you all loved eating it. Your husband will know how to make it now, and he can always surprise you with a delicious, warm apple cake on a cold day. This looks delicious! I’m thinking of making it for a meeting I have on Sunday, but will be doing all of my cooking and baking on Saturday. Does it keep well overnight or would I be better off just mixing up the batter on Saturday and waiting until Sunday morning to bake? Katherine – This cake keeps pretty well in an airtight container. Of course, it is at its best when it has just cooled, but is still warm fresh out of the oven. I wouldn’t recommend mixing the wet and dry ingredients the day before, since the baking powder will start to react and lose its rising power. 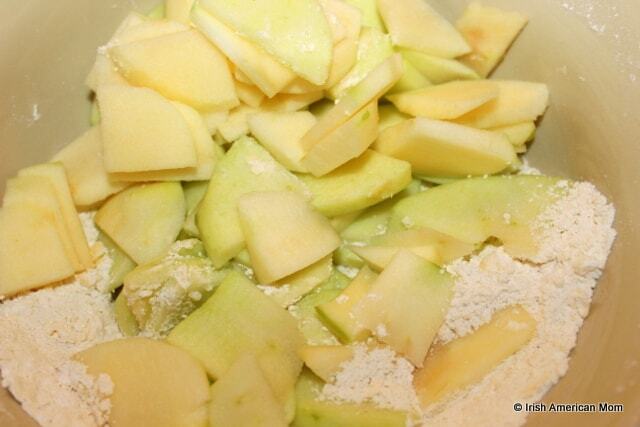 Also the apples need to be peeled fresh to put in the cake batter or else they turn really brown. I think baking the day before and keeping as airtight as possible is your best bet. Best wishes, and have a lovely St. Patrick’s Day. 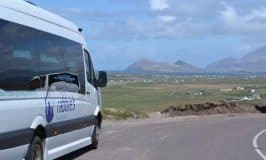 Mairead, it is so good to have stumbled across your site! I’m third generation born in US and my family is from the Limerick area. You have a lovely website and Blog and I’ll be following you on Facebook and linking you with my blog…if you don’t mind! Hi Ebeth – I am delighted you found my blog too and thank you for your kind words. I would be honored if you would link your site to mine. When I have a few moments to myself tomorrow when my kids are at school I’ll check out your blog and stories. My grandmother was from Limerick too – a beautiful part of Ireland. Thanks for stopping by and I hope you had a lovely St. Patrick’s Day. I just finished making this. And oh my god it is so good!!!! The hubby will be pleased since he said I should perfect it in the nice big new kitchen he bought me before he gets home from Afghanistan. Amanda – I am so happy you liked this Irish cake, and I hope your husband will love it too. Enjoy your new kitchen – I am trying to convince my husband we need some new counter tops. A big thank you to you and your husband for your sacrifices as he serves our country. My husband & I just returned from our Honeymoon in Ireland! 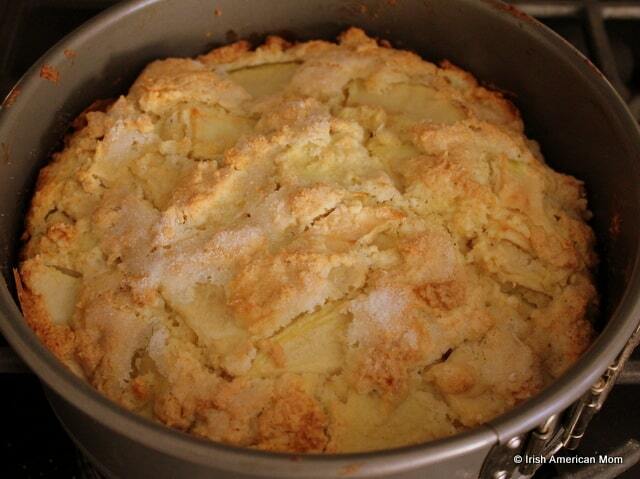 Striving to keep a bit of Ireland around us, I made this apple cake for our Easter dessert & it was delicious! 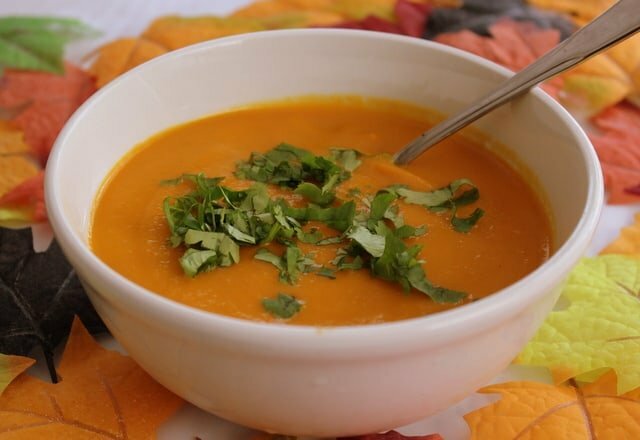 Thank you very much for sharing such a scrumptious recipe! Thank you very much! We also baked the raisin scones this past week & they were amazing as well! I love your website! Thank you!!! At my workplace we all drew a country and then have turns at making something from there to bring for morning tea. I drew Ireland which was fantastic as my great grandfather came out from Ireland to NZ.. However I was then totally stuck. What do people in Ireland eat as a traditional cake?! I Googled it! Thanks so much – this recipe is a God send! I can’t wait to get started and I love your nice clear photos!!! Dear Paula – I’m so glad you found my blog and my recipe for this cake. I hope it was a big success. You’ll delete this comment because you only like posts that say positive things about your horrible recipe. I made this. It was terrible. Don’t bother making this – it’s horrible. Thanks for your feedback Rita. It’s impossible to have a recipe that appeals to all. This cake isn’t sweet as is expected of most American cakes, and will not appeal to many. It really is a type of bread. I just made this today, and it was delicious! I really appreciate your detailed instructions and photos–they made this recipe very easy to put together. I used all-purpose flour and increased the butter to 5 oz, but should have done 6 oz like you said, because it came out a little crusty. I also think I added a bit too much milk since it took a lot longer to bake than it should have. I imagine that also added to the crusty-ness. I’ll definitely file it away to make again, though! 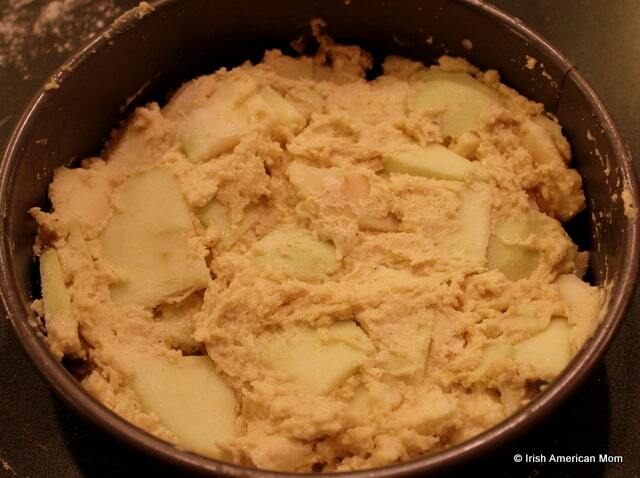 Serena – I hope your next apple cake is a little less crusty. You’ll get to know the right consistency for your oven when you bake it a few times. 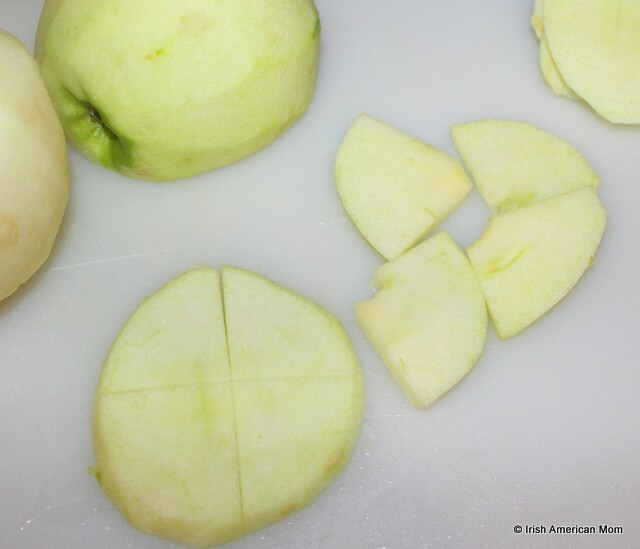 Becky – I hope your apple cake was a success, and that you had a wonderful St. Patrick’s Day. Kaylee – I hope all your students enjoy this little taste of Ireland. when will you bring out your cookbook i really want it, your recipies are great with step by step directions. Such lovely memories, Maureen. I’m starting to work on an e-cookbook, but I have a lot to learn about how to format it. I’m afraid my technical computer skills are sadly lacking, but if I keep plugging away at it, I’ll finish someday. The kids are all back at school, so hopefully I’ll have a little time to myself during the day to dedicate to my cookbook. Thanks for all your support and for following my ramblings. I’ve never had this. I will definitely try it. I too remember my grandmother’s open hearth fire. It was a beautiful sight and many amazing foods came from there. Noreen – I hope you enjoy this cake. It’s lovely to hear you too have memories of your grandmother cooking over the open hearth. What an amazing skill. This looks delicious! I love simple, rustic, hearty cakes/breads. If I made this in a cast iron pan, would I cook it at the same temp and same amount of time? Patty – This recipe was originally created in Ireland many years ago for a cast iron pan or bastible as they were called. Now when my granny cooked it, the bastible would already have been luke warm before being placed over the fire, the lid put on and coals placed on top. The difficulty with estimating times for this recipe is that it depends on how thick your cast iron pan is. When placed in an oven, a cold cast iron pan has to heat and this takes some time, but once it is hot it retains its heat and does a wonderful job spreading the heat evenly around the baking bread. My guess is that you may need an additional five to ten minutes or so cooking time to compensate for the extra time required to heat up the cast iron pan. I’m afraid it really is a case of trial and error, and frequent checking to get it perfect. You could also pre-heat the oven 25 degrees higher, cook on this temperature for 15 minutes, then reduce the heat to finish cooking. I have not yet tried this, but this is my best guess suggestion. Also, make sure your pan is seasoned well to prevent the bread from sticking. I hope these little tips help, and thanks so much for checking out this recipe and my ramblings. Happy St. Patrick’s Day to you too, Maureen. I wanted to print out the recipe and I got 17 pages!! Yikes! I wish there was just the recipe! 17 pages takes up a lot of paper and ink!! Oh no, Denise! That’s terrible. Thanks for letting me know of this glitch. I was going to ask if you printed the whole post or the attached printable recipe, when I noticed the summarized printable recipe was not there. Thanks so much for alerting me to this issue. 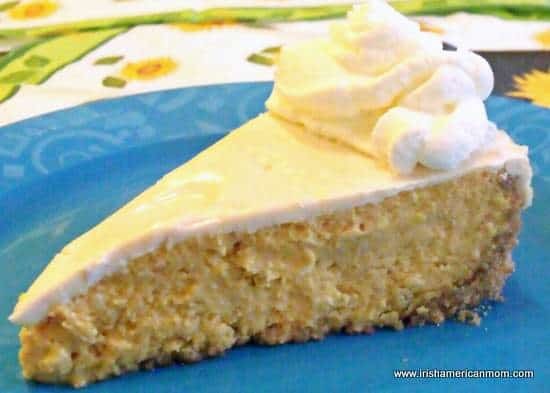 Thanks so much for sharing this recipe; I’m thinking of my many Co. Kerry ancestors as it bakes (McGillicuddy, Connor, Sullivan) – and hoping that they, too, enjoyed this once upon a time. Thanks for posting this cake I’m going to make it now, logging off my computer & I will surprise my daughter in law as she is Irish also I had lived in Ireland & I love the castles & Irish coffee. Have a great day. Hi, I just wanted to stop by and tell you how much I loved this post. I recently made a version (not as glorious as this one, a bit smaller) and used a lot of your tips and techniques! You have a wonderful blog here and I’ve been exploring it! 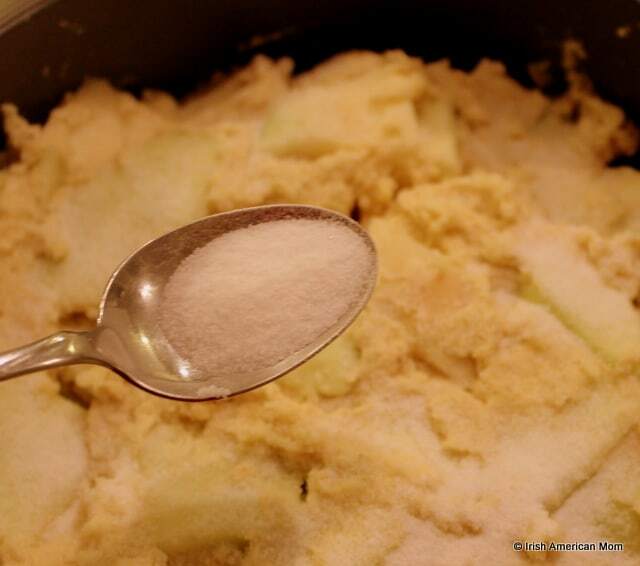 Hi Frugal Hausfrau – Thanks so much for using my recipe to inspire your version of Irish Apple cake – it looks delicious, and thanks for linking back to my blog. I really appreciate it. I’ll be sure to check out your wonderful recipes and budget friendly tips and kitchen tricks. I’m so excited to try this! My husband is from Down/Armagh and we have wedding dishes from Ballydougan with a Bramley apple design! We’re living in the States now but I always try to make recipes that remind him of home. Coming from MN, i was the opposite of you — it took me a long time to get used to apple tart or cake WITHOUT cinnamon. Hi Sarah – I hope your husband will give this cake his seal of approval. Thanks so much for checking out my recipes. I can fully understand how Irish apple tart was a bit of a shock to your system when you first arrived in Ireland. The lack of cinnamon is strange for anyone with American trained taste buds. I must admit that over my twenty something years in America I have grown quite fond of a little cinnamon. I tried your recipe and my cake came out very dense. Is this the expected result since there’s no baking powder? Hi Julie – This cake is dense – closer to bread than cake. 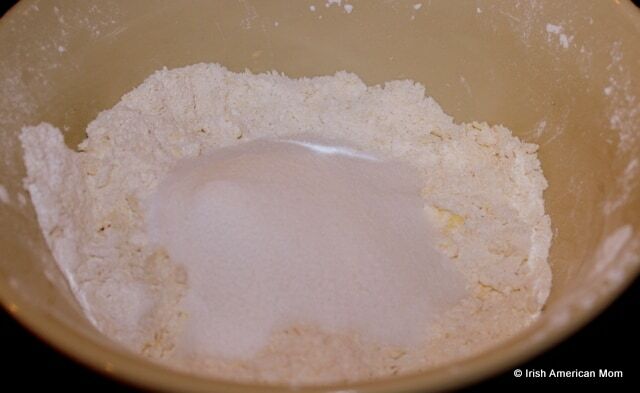 However the recipe uses 2 teaspoons of baking powder. 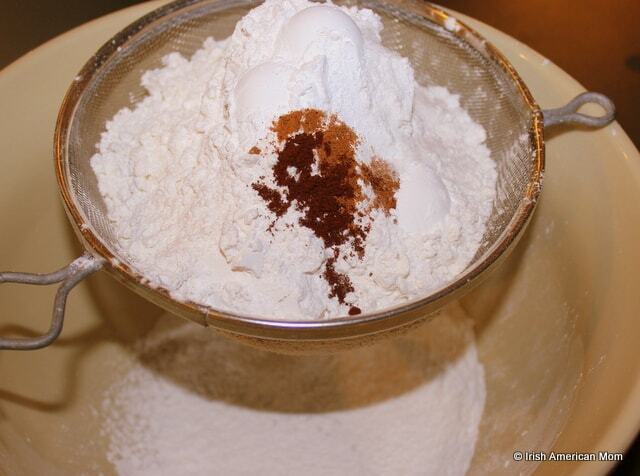 I wonder if your cake is extra dense if you skipped the baking powder. Thanks so much for checking out my recipe, and happy St. Patrick’s Day. I recently discovered your site and have been enjoying it! My mother is from Ireland, too, but ended up staying in America when she found an American to marry. 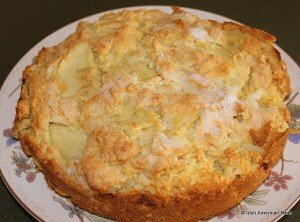 I remember my Granny making apple cake when we would visit her in Ireland, so of course I had to give this recipe a try for St. Patrick’s Day. I just pulled it from the oven and it looks so good, I’m not sure if I’ll be nice enough to wait for the kids and husband to get home from school and work before cutting in to it! Hi Tara – I’m so glad you discovered my little corner of the world wide web. I hope you enjoy your apple cake today, and that you and your family have a lovely St. Patrick’s Day celebration. My ancestry is Irish, and I appreciate this recipe. It helped with the Irish Authenticity. God Bless! Thank you, Mairéad, for the lovely cake recipe. I made this 2 nights ago for our St. Patrick’s Day potluck at work yesterday, and it was spectacular. Everyone loved that it was less sweet than most of our American cakes. I added the extra apple (2 Granny Smiths and 2 Fujis, what I had on hand), and it turned out to be the apple cake I’ve been looking for, for a long time. My only regret was that we didn’t get to eat it warm from the oven. Oh, well, I’ll just have to make another! Hi Suzy – thanks for letting us know your Kerry Apple Cake was a big hit. Thanks so much for trying out my recipe. I think you definitely need to make another so you can try it warm out of the oven. That’s when it is most mouth wateringly delicious. I’m italian And love cooking so much. I try To do this cake And. …WE LOVE It! Is delicious tasty confortable and many More! Thank You. Hi Andreina – I’m delighted to hear you like this recipe. How nice to know you enjoy a little taste of Ireland in Italy. Happy baking. I made this for a potluck last night and it was a huge hit. The recipe was easy to follow and turned out perfectly. Everyone loved it! Thank you! Hi Sarah – Lovely to hear your Kerry Apple Cake was a great success and that your friends gave it their seal of approval. Thanks for trying out my recipe. Wonderful treat! I made this today and it was lovely! I like that it doesn’t have cinnamon-lightly sweet and tasty. Thank you! Hi Lisa – I’m so glad you liked this apple cake. I too like the fact it doesn’t have cinnamon. A hint of cloves and nutmeg gives it a real taste of Ireland. I made this for our St. Patrick’s Day dessert. It was a delicious compliment to our traditional corned beef and cabbage, and Irish soda bread. I will definitely be making it again! Hi Maureen – I’m delighted to hear this cake was a hit in your house for St. Patrick’s Day. Thanks for taking the time to leave your feedback. 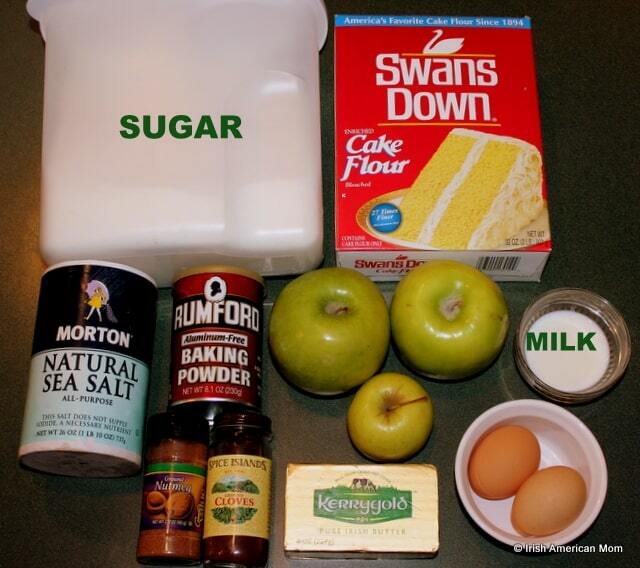 This recipe makes a great cake – and though I love cinnamon, I agree with you – apple cake really only needs cloves. ·Golden Delicious & Ginger Gold also work well (when crisp), especially if combined with more tart varieties. A note on cinnamon – have you tried Mexican cinnamon? It’s flavor is more warm than sharp; I find it more well-rounded than the Saigon varieties usually available in stores (but I’m of half Mexican ancestry, so I could be biased 😜) It’s easiest to find online. Anyway, thanks for sharing your recipe. Thank you so much for these wonderful apple picking instructions when choosing apples for cooking in America. I’m delighted to learn the Rhode Island Greening is most similar to a Bramley. I’ll watch out for them and some of the other cooking/baking apple varieties you recommend. I haven’t tried Mexican cinnamon, but I’ll be sure to check it our. Many thanks for all these tips. What’s your recommendation for storing the cake? The cake was amazing, but spoiled before we ate it all. So many desserts at Thanksgiving. It was so moist. Planning to make it again and perfect making custard with it. Hi Monique – This cake spoils quickly since it is very close to bread and being home baked has no preservative. I like to store it in an air-tight container, but it will only last about 3 days. If it looks like we’re not going to eat the whole cake quickly enough before it spoils, I usually freeze half of the cake. It freezes well. I’m so glad you liked this cake. This cake looks wonderful. I would love to make it for a large gathering on St Patrick’s Day, but I will be cooking many other things. Can I make it a week or so ahead, wrap well and freeze? Would I defrost the day of the party, uncovered? Hi Mary – This cake will freeze well and can be defrosted on the day of the party. You can even heat it for a short while in the oven if you would prefer to serve it warm. It’s delicious with custard. 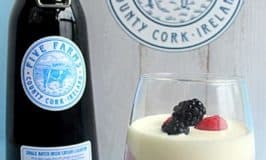 Think I found the dessert for Sunday to accompany the traditional Irish dinner I will be making! Thank you for sharing! Hi Sarah – Have a lovely Saint Patrick’s Day celebration and I hope you enjoy this rustic Irish cake.